Seth Herzog has been hosting weekly comedy show SWEET since 2004, and it currently happens every Tuesday at The Slipper Room. 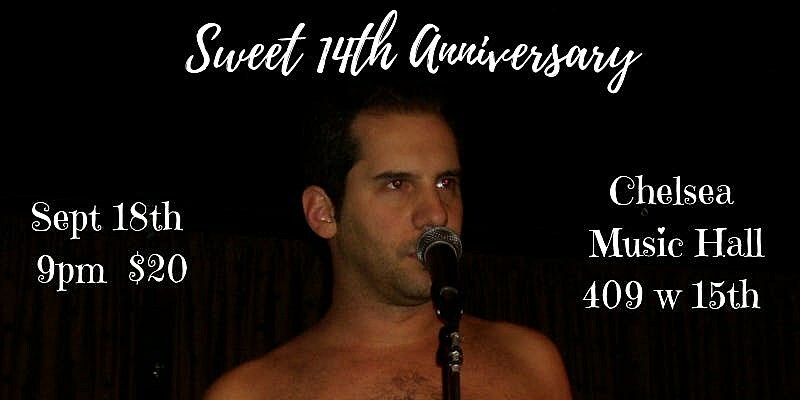 Seth is throwing a special SWEET 14th Anniversary show at on September 18 at Chelsea Music Hall (409 W. 15th St), with special guests Michael Ian Black, David Cross, Phoebe Robinson and maybe some surprise guests. Tickets are on sale now. Though it is a Tuesday, there is no SWEET tonight, but tickets are available for subsequent shows through the rest of the year. Seth is, however, hosting Comedy Night at The Mailroom on Wednesday (9/12) with Dan St. Germain, Emily Blotnick, and Dave Hill. That show is free. Congrats on 14 funny years, Seth!